Eric Sylvain Abidal (French pronunciation: ​[eʁik abidal]; born 11 September 1979) is a French former professional footballer who played as a left back or a central defender, and is the director of football of FC Barcelona. In his career, he played mainly for Lyon and Barcelona, winning 18 titles with both teams combined including two Champions League trophies with the latter. His later career was marked by liver disease, resulting in a transplant. A French international across nine years, Abidal represented the nation in two World Cups – finishing second in 2006 – and Euro 2008. Born in Saint-Genis-Laval, Lyon Metropolis, Abidal started playing with AS Lyon Duchère, an amateur team in the suburbs. He started his professional career with AS Monaco FC, making his Ligue 1 debut on 16 September 2000 in a 3–0 home win against Toulouse FC but only appearing in 22 league matches over the course of two full seasons. Abidal transferred to fellow league club Lille OSC for 2002–03, reuniting with former manager Claude Puel and being first-choice during his spell. Subsequently, he returned to his native region and joined Olympique Lyonnais. During his later years in France, where he won three consecutive national championships – of the seven the team won – Abidal's confidence was shown when Lyon played Manchester United and he was in charge of marking Cristiano Ronaldo: "As a defender, my aim is to infuriate the opponent," he explained. "I want him to be so sick of the sight of me that he has to move somewhere else on the pitch to get away." His defensive teammates at L'OL included François Clerc, Grégory Coupet and Anthony Réveillère, as well as Brazilian internationals Caçapa and Cris. On 10 November 2004, Abidal scored the first goal of his career, in a 2–3 loss at former club Lille for the season's Coupe de la Ligue round-of-32. As a result of his exploit, his parents agreed to get married after a 35-year union. Abidal missed the first months of the 2005–06 campaign after fracturing his metatarsus in a friendly game with Once Caldas. He still managed to appear in 15 matches as Lyon won its fifth national championship in a row (the second with the player). Abidal (far right) playing against Real Madrid. Abidal (center) with Jeffrén Suárez (left) and Bojan Krkić during a training session with Barcelona. On 29 June 2007, Abidal signed a four-year contract with FC Barcelona for €9 million, after repeatedly stating that he would not return to training with Lyon if he was not allowed to move. He was given the number 22 jersey, as the number 20 he wore at Lyon was already taken by Deco; club president Joan Laporta also mentioned that his contract contained a €90 million release clause, and that Lyon would receive an extra €500,000 if Barcelona won the UEFA Champions League in any of the following four seasons. 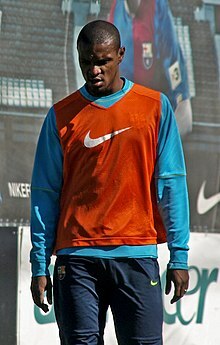 Abidal made his La Liga debut on 26 August 2007 in a 0–0 away draw against Racing de Santander, and completed his first season with 30 games as Barça finished in third place in the league. He missed the 2009 Champions League Final against Manchester United after picking up a red card in the semi-final against Chelsea: the referee deemed Abidal to have fouled countryman Nicolas Anelka and denying a scoring opportunity, although video evidence suggested that any contact was minimal; again through suspension he also did not dress up for the decisive match of the Copa del Rey, as the team won the treble. In 2009–10, Abidal continued to be the starter for the Pep Guardiola-led side, even after the arrival of Maxwell from Inter Milan. He scored his first goal on 5 January 2011, netting at the San Mamés Stadium in the Spanish Cup round-of-16 second leg (1–1 away draw, away goals rule qualification). Abidal during the 2009 Club World Cup in Abu Dhabi. On 18 January 2012, Abidal scored his second goal for Barcelona, also in the domestic cup, helping the visitors come from behind to win it 2–1 at Real Madrid (eventually 4–3 on aggregate). He renewed his contract early into the following month, keeping him at the Camp Nou until 30 June 2013, but on 30 May of that year it was announced that the club would not further extend it. On 15 March 2011, Barcelona announced that Abidal had been diagnosed with a tumour in his liver, and the player underwent surgery two days later. Citing privacy concerns as wished by the player, the club did not release additional information in regards to his condition. In response to the announcement, players and fans around the world dedicated well wishes to him on various social networking service and sports websites. Before their round-of-16 match in the Champions League, both Real Madrid and Lyon players took the pitch wearing Ánimo Abidal (Get Well Abidal) T-shirts, with the same message being displayed on the Santiago Bernabéu Stadium's scoreboards, in a show of support and solidarity. During Barcelona's match with Getafe CF on 19 March 2011, the fans at the stadium clapped for the entire 22nd minute (the player's shirt number). On 28 May 2011, in the Champions League Final against Manchester United, he played the full 90 minutes of Barcelona's 3–1 triumph and, in a gesture to mark his recovery, Carles Puyol handed him his captain's armband and allowed him to be the first to lift the trophy in front of 85,000 people at Wembley Stadium in London. On 15 March 2012, it was announced that Abidal would have to undergo a liver transplant because of problems which were unresolved with the previous operation. On 10 April he underwent surgery, with his cousin Gérard being the donor. On the same day Barcelona beat Getafe 4–0, and the victory was dedicated to the player in the post-game press conference; he later revealed that his friend and teammate Dani Alves offered to donate part of his liver for the transplant, but he denied because it would have affected the latter's playing career. On 21 May 2012, Abidal was released from hospital to resume the recovery process at his home, and doctors revealed that he could still play football in the near future if he wished. He returned to training in the Pyrenees in October 2012 but, the following month, he stated that his priority was a return to full health rather than resuming his football career. On 18 December 2012, Abidal was given the green light to start training again, and he returned to active in January of the following year. On 19 March of the following year he played 65 minutes for FC Barcelona B in a practice match with FC Istres, and on 6 April he returned to official play, replacing Gerard Piqué for the last 20 minutes of a 5–0 home win against RCD Mallorca. Two weeks later he played the full 90 minutes for the first time since his comeback, featuring in a 1–0 home success over Levante UD. On 8 July 2013, 33-year-old Abidal returned to Monaco after more than one decade, signing for one season with the option of a further one. After helping the principality team secure a place in the Champions League in his debut campaign, he agreed to a one-year contract extension. On 5 July 2014, two days after renewing his link to Monaco, Abidal signed a two-year contract with Olympiacos FC. On 19 December, however, he retired from the game for personal reasons. Abidal returned to Barcelona in June 2018, replacing Roberto Fernández as the club's director of football. Abidal earned 67 caps for the France national team, his debut coming on 18 August 2004 in a friendly with Bosnia and Herzegovina. He was selected for the 2006 FIFA World Cup, playing all the games and minutes in the country's runner-up campaign as left back, with the exception of France's match against Togo, from which he was suspended after earning two yellow cards in the first two games. In the final against Italy, he scored his penalty shootout attempt. Again under Raymond Domenech, Abidal was first-choice during the Euro 2008 qualifying campaign. In the final stages he appeared against Italy as a centre-back, but conceded a penalty and was sent off in the first half of an eventual 0–2 loss and group stage exit. He played against Uruguay and Mexico in the 2010 World Cup again at centre-back, opting out of the next game against host country South Africa as the French side again left the competition after only three matches. Abidal was a tactically intelligent and versatile defender, capable of featuring as a centre or left back due to his positional sense and his ability to read the game. In his prime, he was also quick and strong which, along with his technical ability and distribution, allowed him run up the wing to assist his team offensively as well as defensively. Abidal married former gymnast Hayet Kebir in 2003, fathering children Méliana, Canélia, Leyna, Kenya and Edan. After his wedding, he converted to Islam. ^ "FIFA World Cup South Africa 2010: List of players: France" (PDF). FIFA. 4 June 2010. p. 10. Retrieved 26 January 2019. ^ a b "Graft not glitz defines Abidal's Monaco memories". UEFA. 24 August 2011. Archived from the original on 23 October 2013. Retrieved 10 November 2012. ^ a b "Barcelona star Abidal returns to training after liver transplant". CNN. 10 October 2012. Retrieved 10 November 2012. ^ a b "French Focus: Eric Abidal (Lyon)". Channel 4. Retrieved 9 October 2007. ^ "Milan 3–1 Lyon (Agg: 3–1)". The Guardian. 4 April 2006. Retrieved 10 November 2012. ^ "Roma 0–0 Lyon". BBC Sport. 21 February 2007. Retrieved 10 November 2012. ^ "Abidal punishment". UEFA. 19 November 2004. Retrieved 19 September 2012. ^ "Lyon learn worst about Abidal". UEFA. 25 July 2005. Retrieved 19 September 2012. ^ "Bordeaux slip gives Lyon fifth straight title". The Guardian. 17 April 2006. Retrieved 10 November 2012. ^ "Abidal joins Barcelona". FIFA. 29 June 2007. Retrieved 30 July 2007. ^ "The first squad list". FC Barcelona. 25 August 2007. Retrieved 10 November 2012. ^ "`Fantastic Four' fail to fire for Barca". The Standard. 28 August 2007. Archived from the original on 23 October 2013. Retrieved 10 November 2012. ^ "Murcia 3–5 Barcelona: Dos Santos hits treble". ESPN Soccernet. 17 May 2008. Retrieved 10 November 2012. ^ "Iniesta's late heartbreaker". ESPN Soccernet. 6 May 2009. Retrieved 10 June 2012. ^ "Llorente the party pooper". ESPN Soccernet. 10 May 2009. Retrieved 10 June 2012. ^ "One title closer to the treble". ESPN Soccernet. 14 May 2009. Retrieved 10 November 2012. ^ "Guardiola praises Barca bravery". BBC Sport. 26 May 2009. Retrieved 10 November 2012. ^ "Sin magia también se puede en San Mamés" [Magic not needed in San Mamés]. El Mundo (in Spanish). 6 January 2011. Retrieved 10 June 2012. ^ "Barca fight back at the Bernabeu". ESPN Soccernet. 18 January 2012. Retrieved 10 June 2012. ^ "Abidal, hasta 2013: "Quiero seguir haciendo historia"" [Abidal, until 2013: "I want to continue making history"]. Diario AS (in Spanish). 3 February 2012. Retrieved 10 June 2012. ^ "Abidal: "I'm going and I'll definitely be back"". FC Barcelona. 29 May 2013. Retrieved 30 May 2013. ^ "Barcelona release Eric Abidal after his return from liver transplant". The Guardian. 30 May 2013. Retrieved 30 May 2013. ^ "Eric Abidal to undergo surgery after Barcelona full-back diagnosed with a liver tumour". Daily Mail. 16 March 2011. Retrieved 10 November 2012. ^ "Abidal diagnosed with tumour on liver". FC Barcelona. 15 March 2011. Archived from the original on 2 August 2012. Retrieved 16 March 2011. ^ "Barca's Abidal set for surgery on tumour". ESPN Soccernet. 15 March 2011. Retrieved 16 March 2011. ^ "El mundo del deporte se vuelca con Abidal" [Sports world supports Abidal]. Mundo Deportivo (in Spanish). 18 March 2011. Retrieved 18 March 2011. ^ "'Ánimo Abidal', mensaje de ánimo en el Bernabéu" ['Ánimo Abidal', message of support at the Bernabéu]. Marca (in Spanish). 16 March 2011. Retrieved 16 March 2011. ^ "Abidal still climbing mountains as France face Spain". Yahoo Sports. 16 October 2012. Archived from the original on 19 October 2012. Retrieved 10 November 2012. ^ "Eric Abidal looks for a repeat of heart-warming recovery as football family comes together again". The Independent. 3 April 2012. Archived from the original on 12 October 2012. Retrieved 10 November 2012. ^ "Abidal lifts the 4th trophy". FC Barcelona. 26 May 2011. Retrieved 10 June 2012. ^ "Barcelona defender Eric Abidal to have a liver transplant". BBC Sport. 15 March 2012. Retrieved 15 March 2012. ^ "Barcelona defender Eric Abidal recovering well after liver transplant surgery". The Daily Telegraph. 11 April 2012. Retrieved 15 November 2012. ^ "Barcelona dedicate win to Abidal". ESPN Soccernet. 11 April 2012. Retrieved 11 April 2012. ^ "Guardiola dedicates Getafe win to Eric Abidal". Xinhua News Agency. 11 April 2012. Retrieved 10 November 2012. ^ "Eric Abidal says Dani Alves offered him part of his liver for transplant". The Guardian. 16 September 2013. Retrieved 28 May 2014. ^ "Abidal could play on". The Sun. 1 June 2012. Retrieved 4 June 2012. ^ "Barcelona defender Eric Abidal has begun training again following his liver transplant earlier this year". Sky Sports. 10 October 2012. Retrieved 9 November 2012. ^ "Abidal: Returning to football not my objective". Goal. 6 November 2012. Retrieved 15 November 2012. ^ "Barcelona's Abidal given the green light to play football again". Goal. 18 December 2012. Retrieved 18 December 2012. ^ "Éric Abidal plays practice match against Istres". FC Barcelona. 19 March 2013. Retrieved 13 May 2014. ^ "Fabregas fires Barca to victory". ESPN FC. 6 April 2013. Retrieved 7 April 2013. ^ "Abidal: "Gracias a mi primo, sin él no estaría aquí"" [Abidal: "Thanks to my cousin, i would not be here without him"]. Marca (in Spanish). 7 April 2013. Retrieved 7 April 2013. ^ "Below-par Barca leave it late". ESPN FC. 20 April 2013. Retrieved 22 April 2013. ^ "Le retour d'Eric Abidal" [The return of Eric Abidal] (in French). AS Monaco. 8 July 2013. Archived from the original on 8 July 2013. Retrieved 10 July 2013. ^ "Abidal seguirá un año más en el Mónaco" [Abidal to continue one more year with Monaco]. Sport (in Spanish). 3 June 2014. Retrieved 27 July 2014. ^ "Eric Abidal leaves Monaco for Olympiakos". BBC Sport. 5 July 2014. Retrieved 6 July 2014. ^ "Former Barcelona and France defender Eric Abidal announces retirement from football". Daily Mail. 19 December 2014. Retrieved 19 December 2014. ^ "Soccer-Abidal Returns to Barcelona as sporting director". The New York Times. 7 June 2018. Retrieved 15 June 2018. ^ Gallagher, Danny (19 June 2018). "Eric Abidal returns to Barcelona as sporting director". Sky Sports. Retrieved 20 June 2018. ^ a b "French football federation invite Abidal as guest for Sweden clash". Goal. 13 June 2012. Retrieved 9 November 2012. ^ "Togo 0–2 France – Stats/action". BBC Sport. 23 June 2006. Retrieved 9 November 2012. ^ "France 0–0 Switzerland". BBC Sport. 13 June 2006. Retrieved 9 November 2012. ^ "France 1–1 South Korea". BBC Sport. 18 June 2006. Retrieved 9 November 2012. ^ "Italy 1–1 France (aet)". BBC Sport. 9 July 2006. Retrieved 9 November 2012. ^ "France 0–2 Italy". BBC Sport. 17 June 2008. Retrieved 9 November 2012. ^ "World Cup 2010: Uruguay v France – as it happened". The Guardian. 11 June 2010. Retrieved 9 November 2012. ^ "France v Mexico: as it happened". The Daily Telegraph. 17 June 2010. Retrieved 9 November 2012. ^ "World Cup 2010: Eric Abidal chose not to play against South Africa – France coach Raymond Domenech". Goal. 22 June 2010. Retrieved 9 November 2012. ^ "World Cup 2010: South Africa beat red-faced France and both bow out". The Guardian. 22 June 2010. Retrieved 9 November 2012. ^ "Éric Abidal" (in Spanish). FC Barcelona. Retrieved 21 January 2015. ^ Peter Berlin (8 July 2006). "France and Italy – Settled and similar". The New York Times. Retrieved 24 January 2017. ^ a b "2010 FIFA World Cup: Ranking the Top 20 WAGs of the Soccer Elite – 16. Hayet Abidal". Bleacher Report. 24 May 2010. Retrieved 15 November 2012. ^ "Euro 2012: Wives and girlfriends – France: Hayet & Éric Abidal". MSN. 24 April 2012. Retrieved 15 November 2012. ^ "Femmes de footballeurs: qui sont-elles? – Hayet et Eric Abidal" [Footballers' wives: who are they? – Hayet and Eric Abidal] (in French). Elle. Retrieved 15 November 2012. ^ "E. Abidal". Soccerway. Retrieved 2 July 2014. ^ "Éric Abidal". EU-Football.info. Retrieved 13 January 2016. ^ "Abidal wins Aldo Rovira Award 2011/12". FC Barcelona. 28 June 2012. Retrieved 11 May 2017. ^ "Wall of Fame". Globe Soccer. Retrieved 28 December 2015. ^ "Ad Abidal il Premio Facchetti – "Un'altra vita? La vorrei così"" [To Abidal the Facchetti Award – "Another life? I would want it like this"]. La Gazzetta dello Sport (in Italian). 30 October 2013. Retrieved 21 January 2015. Wikimedia Commons has media related to Éric Abidal.